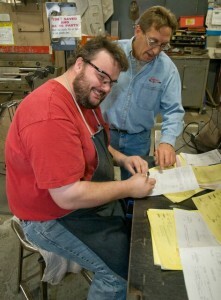 Sheet Metal Manufacturing - Fabrication & Design Process | Jones Metal, Inc. Whether your project is at the idea stage or is fully developed with a full-print specification, the engineers at Jones Metal use the latest solid modeling and machine-utilization software to ensure each project is optimally designed for Jones Metal’s best-manufacturing processes. The design for manufacture process integrates quality specifications, shortens production time, reduces waste, and minimizes costs. This results in a better product, manufactured to meet or exceed your expectations. As an ISO 9001:2008 certified facility, Jones Metal has developed a continual-improvement quality management system with a focus on customer satisfaction. This continual-improvement goal is driven by an understanding that quality is everyone’s responsibility. Since 2008, Jones Metal has been implementing lean manufacturing best-management practices, including Six Sigma, 5-S, A-3, Kanban, Kaizen, and Supermarket. These ongoing practices are designed to shorten lead times, reduce waste, improve flexibility in meeting customer needs, and add overall value to the services Jones Metal provides. Jones Metal is a paper-free manufacturing facility using state-of-the-art ERP software. Everyone in the company uses real-time information to deliver high-quality metal fabrication on time.